Haifa, Israel - With seemingly limitless wealth and a penchant for often supporting both sides of the argument, the State of Qatar has become a highly significant player in Middle East power-politics. Recent events in Egypt and Syria, however, have put the brakes on Qatar's ambitions. In this second part of his analysis of its attempt to influence regional politics, Paul Alster considers how much its flamboyant foreign policy, centered on furthering the interests of the Muslim Brotherhood, might be coming back to haunt Qatar. July 3 was not a good day for Mohammed Morsi. The Muslim Brotherhood's man was ousted from power after just a year as Egypt's president, having lost the essential confidence of the country's powerful military leaders. July 3 was also a black day for the State of Qatar, the country which had nailed its colors and its money firmly to the Muslim Brotherhood mast, and which suddenly found itself the target of outrage on the Egyptian street and beyond. Morsi came to power in a democratic election, but misinterpreted the meaning of democracy. He and his Muslim Brotherhood backers – primarily Qatar – appeared to believe that having won the election, they could run the country according to their decree, not according to democratic principles as the majority had expected. A series of draconian laws, a spiralling economic crisis, and a feeling on the Egyptian street that the Muslim Brotherhood was paid handsomely by foreign forces, spurred street protests of historic proportions, prompting the military to intervene. With Morsi gone, Qatar suddenly became "persona non grata" in Egypt. Qatar sought to extend its influence and Muslim Brotherhood-inspired view of how countries like Egypt, Syria, Libya, and others should be. Qatar was also playing a power-game against Saudi Arabia, another hugely wealthy regional power whose vision of an even more strictly Islamist way of life for Muslims drove a wedge between the two parties. Another seismic change hit the region just nine days before Morsi's fall. The Emir of Qatar, Sheikh Hamad bin Khalifa al Thani – in power since overthrowing his own father back in 1995 – voluntarily abdicated in favor of his 33-year-old son, Sheikh Tamim. Tamim, educated in England and a graduate of the prestigious Sandhurst Military Academy, became the region's youngest leader, with the eyes of the world watching to see if he would maintain his father's aggressive policy of extending Qatar's regional influence. Few could have imagined that he would very quickly find himself at the center of a major political crisis as Egypt – a country in which Qatar had so much credibility and money invested – imploded before his eyes. Within hours of Morsi's departure, the streets of Cairo were awash with anti-Qatari banners accompanied by the obligatory anti-US and anti-Israel slogans. Al Jazeera – a staunch promoter of the Muslim Brotherhood view in Egypt – was vilified, its reporters attacked on the streets, its offices ransacked. Al Jazeera also had been hit seven months earlier after supporting Mohammed Morsi's crackdown on young Egyptian demonstrators opposed to the rapid Islamisation of Egypt under the new government. In the first part of my analysis of Qatar's policy in the region, I focused on Al Jazeera's huge influence on opinion in the Arab world and the West, portraying the Qatari-Muslim Brotherhood version of events in a way that the uninformed viewer might believe to be objective reporting. Nothing could be further from the truth. Al Jazeera's carefully crafted smokescreen as the moderate voice of the Arab world has taken a significant battering with the events in Egypt. That should serve as a wake-up call to those trumpeting the imminent launch of Al Jazeera America scheduled for August 20. "There is a lingering perception in the U.S. –right or wrong – that the network [Al Jazeera] is somehow associated with terrorism, which could slow its progress in gaining carriage," Variety Magazine's Brian Steinberg suggested last month. Dubai-based writer Sultan Al Qassemi observed in Al-Monitor: "Qatar has dedicated Al Jazeera, the country's most prized non-financial asset, to the service of the Muslim Brotherhood and turned it into what prominent Middle East scholar Alain Gresh [editor of Le Monde diplomatique and a specialist on the Middle East] calls a 'mouthpiece for the Brotherhood.'" The channel has in turn been repeatedly praised by the Brotherhood for its 'neutrality.'" The Economist, reporting in January, reflected the growing dissatisfaction amongst many in the Arab world. "Al Jazeera's breathless boosting of Qatari-backed rebel fighters in Libya and Syria, and of the Qatar-aligned Muslim Brotherhood in Egypt, have made many Arab viewers question its veracity. So has its tendency to ignore human-rights abuses by those same rebels, and its failure to accord the uprising by the Shia majority in Qatar's neighbor, Bahrain, the same heroic acclaim it bestows on Sunni revolutionaries." In June, a vocal and agitated group of nearly 500 protesters took to the streets in Benghazi, Libya - the city where U.S Ambassador Christopher Stephens and three colleagues were killed last fall - demanding that Qatar stop meddling in Libyan internal affairs. "Much of the opposition was directed at Qatar which protesters claimed was supporting Libyan Salafists and the Muslim Brotherhood," Middle East Online reported at the time. "Analysts believe that Qatar is trying to take advantage from a scenario repeated in both Tunisia and Egypt, where the Muslim Brotherhood, which was an active participant in revolutions, seized power," the story said. To the casual observer, it might appear strange that the country that was perhaps as instrumental as any in helping bring about the downfall of the hated Colonel Muammar Gadaffi in Libya back in 2011 should be the target of such vitriol. Qatar, a close U. S. ally, was the main conduit through which weapons transfers were made to Libyan rebels who eventually overpowered forces loyal to the long-time dictator. As Libyans attempt to create a new order in their fractured country, many now believe that the Qatari regime's Salafist sympathies contribute to a growing influence of radical Islamist groups in Libya with similar ideological beliefs to the Qatari royals. Concerns had surfaced as early as January 2012. "But with [Muammar] Gaddafi dead and his regime a distant memory, many Libyans are now complaining that Qatari aid has come at a price," reported Time magazine's Steven Sotloff. "They say Qatar provided a narrow clique of Islamists with arms and money, giving them great leverage over the political process." Sotloff quoted former National Transitional Council (NTC) Deputy Prime Minister Ali Tarhouni as saying, "I think what they [Qatar] have done is basically support the Muslim Brotherhood. They have brought armaments and they have given them to people that we don't know." And then there's the question of Qatar's meddling in Syria's civil war. "I think there are two [Qatari] sources of mostly 'soft' power – their money and Al Jazeera," Amos Yadlin, former head of Israeli military intelligence, told the Investigative Project on Terrorism. "They are using their soft power to advance their regional goals. In Libya it was not necessarily a negative. In Syria they are supporting the Muslim Brotherhood [allied to the Free Syrian Army]." "Now, what you have to assess," Yadlin continued, "is whether the Muslim Brotherhood is better than Bashar [al-Assad], and whether the Muslim Brotherhood is better than the Jihadists and the Al Nusra Front [supported by Saudi Arabia]." Yadlin's pragmatic view reflects the dilemma of many considering intervention on behalf of the rebel forces in Syria. Is it better to try to arm the moderate elements of the FSA and have them replace the Assad regime? Would risking weapons supplied by the West and countries like Qatar and Saudi Arabia falling into the wrong hands, possibly usher in an even more dangerous Jihadist regime that could destabilise the region even further? Qatar played on these fears by presenting the Muslim Brotherhood as a relatively moderate force, but many now fear it is a wolf in sheep's clothing and no less dangerous than the Al Nusra Front terror group, which was added to the UN sanctions blacklist May 31. Writing for the Russian website Oriental Review.org on May 23, Alexander Orlov reminded readers that Qatar was on the U.S. list of state sponsors of terrorism during the 1990s, and sheltered Saudi nationals who were later revealed to have contributed to the 9/11 atrocities. He suggests that the U.S. turned a blind eye to Qatar's previous record in return for using the massive Al Udeid facility as a forward command post in 2003 for the U.S. invasion of Iraq. Orlov reminds us that Qatar was a major financier of the Islamist rebellion in Chechnya in the 1990s, and that after the Islamists had been routed by the Russian army, the [now former] Qatari emir gave sanctuary to one of the most wanted leaders of the Islamist rebellion, Zelimkhan Yandarbiyev, a figure who has inspired Chechen Islamists ever since. Yandarbiyev was subsequently assassinated by a car bomb in the Qatari capital Doha in 2004. 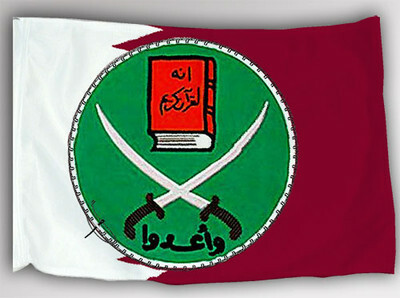 Qatar long ago signed up to the Muslim Brotherhood cause. It believed that this alliance would promote Qatar to being the foremost player in Sunni Muslim affairs at the expense of its main rival, Saudi Arabia. Recent events suggest that gamble may have blown up in its face. Sheikh Tamim's rise to power appears to have created an opportunity to mend bridges with Saudi Arabia after his father Sheikh Hamad's antagonistic relationship with Riyadh. Saudi Arabia was a key Brotherhood supporter from the 1950s until the 9/11 attacks. Then, in a bid to distance itself from the damning fact that 15 of the 19 bombers were Saudis, Riyadh insisted that Muslim Brotherhood radicalization of the bombers was a significant factor. Qatar's Sheikh Hamad quickly stepped into the breach and became the Muslim Brotherhood's biggest supporter, offering Doha as a base for spiritual leader Yusuf al-Qaradawi. It is significant, then, that the new Qatari leader's first foreign visit was to Saudi Arabia. He arrived there last Friday, reported the Gulf Times. "Talks during the meeting dealt with existing fraternal relations between the two countries and ways to develop them in various fields," the official Qatar News Agency said. Tamim's outreach to Saudi Arabia suggests that the two countries may be on the verge of rapprochement. Where that development leaves the Muslim Brotherhood, Qatar's huge investment in underwriting the Egyptian economy, the funding of rebel forces in Syria, and Qatar's previous foreign policy in the region, remains to be seen. The choices Qatar's newly appointed young leader, Sheikh Tamim bin Hamad al-Thani, makes over the next few weeks and months may have a significant impact on regional politics and on Qatar's future role on that stage for years to come. "I suspect the Qataris will draw back somewhat," former U.S. Ambassador to Saudi Arabia Robert Jordan told Reuters. "Their infatuation with the Muslim Brotherhood has probably been dampened. They're likely to come around to a position closer to the Saudis." Obama keeps saying he might still arm Syria's 'moderate' anti Assad forces. Give us all a break, everyone - Qatar, Saudi, Kuwait, NATO, especially Turkey have been arming ALL the fighters in Syria for three years. It is a Balkanisation project to smash Syria, and they all want a piece of the pie, Gulf oil pipes could be laid to Turkey and onto Europe, Israel could take the full Golan Heights with no local southern Syrian Druze opposition, the Shia axis from Iran to South Lebanon could be cut and the regional Sunni position strengthened. It's a perfect storm of realpolitik and aligned interests all at the cost of Syrian lives. Viva Assad! Qatar did its thingy with the approval of the brat in the witless house and his trolls. It doesn't take much imagination to guess what is behind the huge Bengahzi cover-up. We know it was about transferring SAMs to Syrian rebels and that they have been 'stolen'. We know that Morsi had his finger-prints on the raid and we know that Qatar backs the Muslim Brotherhood. Was it in-fighting, was it some not wanting the arms to go via Turkey or to go to the 'wrong' group of rebels? The question is to what extent Qatar money is implicated in the Administration's policy-making. We've certainly never known Hillary to knock back a monetary offer and we know that Obama is in ideological sympathy with the Muslim Brotherhood, as he has made perfectly clear by appointing their minions to positions of influence plus the Attorney General is CAIR's cur! And where does all the money come from to build the hundreds of mosques here?